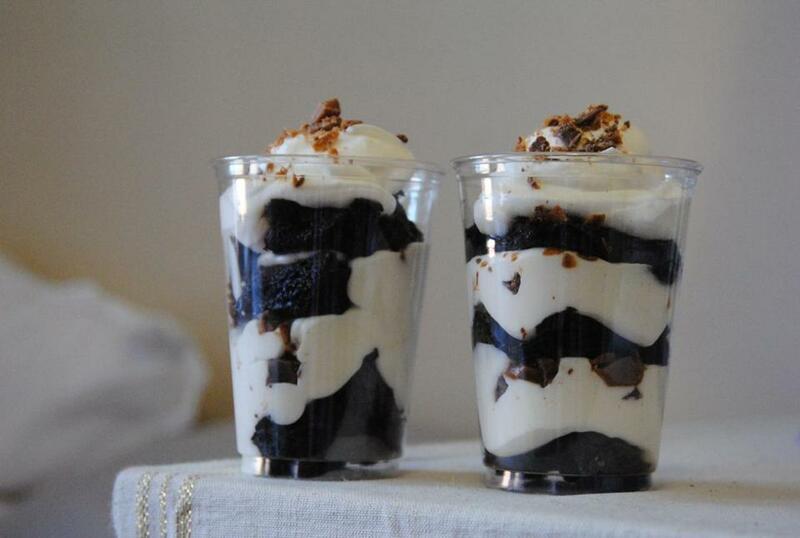 Articles on bu.spoonuniversity.com include a recipe for easy brownie parfaits. The nine students spread out over two long tables in the back room of Boston University’s George Sherman Union Food Court on a Monday night could be any study group or assemblage of friends. But the way they are critiquing the bags of healthy snack foods scattered among them, and the container of homemade chocolate oat bars just daring someone to dig in, suggest that something else is going on here. Rachel DeSimone (responsible for the oat bars) calls the group to order. “What are the best things we’ve eaten this week?” she asks. The purpose of the gathering begins to take focus. DeSimone, a senior in BU’s School of Hospitality Administration, who is minoring in magazine journalism at the School of Communication, is editor in chief of Spoon University’s BU chapter. Bu.spoonuniversity.com is an online food website and this is its weekly meeting of contributors. Launched in 2013 by two Northwestern University graduates, Spoon University is written by and for college students with articles, photos, and videos covering everything from restaurant reviews to on-campus dining to cooking in one’s dorm or apartment. BU is among 63 nationwide campuses to host a chapter; the number of colleges is growing rapidly. According to Mackenzie Barth, who founded the site with Sarah Adler, Spoon began life as a print magazine at Northwestern during the students’ senior year. “We were having great experiences with food and wanted to share,” she explains. They grew to a staff of 100 students, produced three issues, and began to hear from their peers at colleges and universities all over the country, asking for help with their similar efforts. “We realized this is bigger than Northwestern,” Barth says. At BU, DeSimone’s friend, Lauren Fisher, who graduated in 2014, brought Spoon to campus last spring. DeSimone was the original managing editor and became editor in chief when Fisher graduated. Her close friend Laurel Greenfield was the copy editor. Currently working toward a master’s degree in gastronomy at the university’s Metropolitan College, Greenfield is now the business manager. “I have always been immersed in food,” says DeSimone, a Manhattan native. She has worked at a number of restaurants in Boston, New York, and Sydney, where she studied last year, and began writing about food for her own amusement during her freshman year. “Spoon University coming here was just what I needed; what our school needed, too, I think,” she says. The site’s other contributors — there are roughly 20 writers, photographers, and marketers, with some people overlapping functions — came on gradually, each learning about it via social media or through friends. Most, but not all, are students in the university’s College of Communication or Hospitality Administration. All share a passion for food. And some were already blogging about it before Spoon was started. 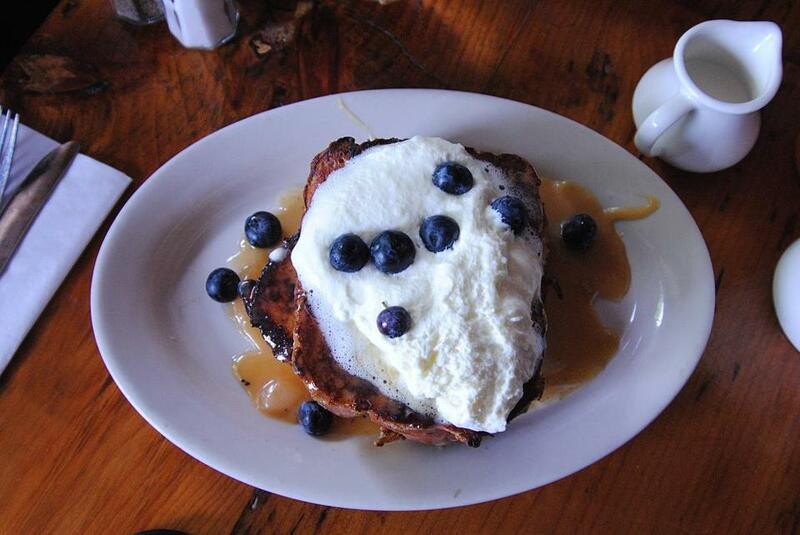 A review of The Haven in Jamaica Plain where the writer extolled on the toffee French toast. Content on the site is divided into six general categories, and while chapters are free to develop their own content, there is a definite Spoon style. For consistency across the site, the founders created what they call a “secret sauce,” which teaches all contributors fundamentals like how to work with the underlying technology and the editorial voice. DeSimone says that when Spoon first launched at BU, the Eat Out stories, covering area restaurants, received a lot of views, but now viewership seems to have evened out across categories. Lush photography from locales like The Haven in Jamaica Plain, with budget-friendly menus, helps draw people in. For those not on a dining plan, a Cook category offers recipes for food and beverages. Contributors studying abroad add an international dimension. One in Morocco recently posted a story on etiquette while dining with her host family. Another, studying in Dublin, promises stories on the local pub scene. In October, BU granted Spoon University student activity status, which means the group will receive funding and will have greater visibility. That will help recruit contributors and build readership. They may even get a designated space, so they won’t have to meet in the food court any more. But maybe, given their leanings, they’re happy where they are.